Well bazooka and panzerschreck have delaying animations while activating the sights. My suggestion : Please make piat's and panzerfaust's delaying animations longer to match with other at weapons. piat ja, panzerfaust no, as panzerfaust has an ammo disadvantage against the other 3 types. This video makes me realize that the panzerfaust is aimed like if it was a rifle, and not a rocket with back-fire. As it is now the back of the tube is on the body of the shooter, so maybe make something for changing this to something that looks more like the bazooka ? 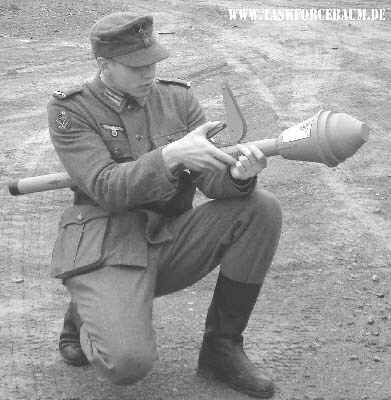 ^ That is how the panzerfaust was used. Not like the bazooka. I thinked it was shooted like a normal rocket, but even, he's holding it on his side, not if front of him. Germans have more armor on their tanks. Which means you need to learn to flank them. SUFFER! piat where heavy and the least reliable of all AT weapons (clumpsy to shot, not very accuarate,etc), they should be like that ingame. Piat will kill a stug or p4 with one shot to the rear. And making the already weak Anti-tank weapons of commenwealth even weaker? Piats are the best AT and AI weapon ingame. The shoot accurate as hell over the full distance, and you can easily kill german tanks from behind with 1-2 rockets, and have still one left to damage another one!. Germans: Panzerfaust, 30m, bad view with the weapon, and you also need to get to sides to kill something, then you need to run back. and btw take it as it is Tao, German tanks had better armour on the mass of their tanks! have you even read the thread!!!??!?!!? Its about to make all anti tank weapons equal in the aiming time! Not about making Piat weaker. eventhough it shoud bet more inacurate!!! !